When the teeth are not aligned properly it makes your smile looks less appealing. When I explain to my patients the options available to straighten the teeth, orthodontics (braces) is at the top of the list, and many times they will ask me if they can straighten their teeth without having to wear braces (orthodontics). The answer to that question is “it depends”, and that is because the worse the misalignment, the more likely that the case will need orthodontics. 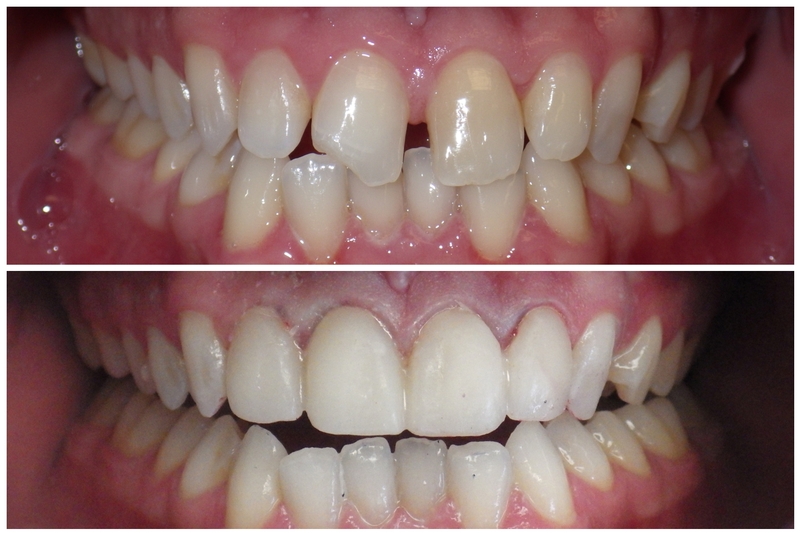 Some cases can be treated with cosmetic porcelain crowns or veneers, while the more severe cases require orthodontics. The answer also depends on the desires of the patient. Some moderately misaligned cases can be treated with porcelain crowns or porcelain veneers without braces. But is you want to get “minimally invasive” treatment in order to need the smallest amount of reduction to your teeth, then most cases will benefit from and need orthodontics. This week I started this case without orthodontics because the patient is leaving the area, and did not want the orthodontic treatment. You can see that the teeth are at the wrong angle, with large spaces, narrow teeth and a fractured tooth. The temporaries corrected the malpositioned teeth fairly well, but in order to accomplish that, some teeth had to be reduced more than the normal amount of reduction needed for porcelain veneers. Even after straightening the teeth with orthodontics, many patients need veneers or crowns to correct teeth that are worn or have the wrong shape. If you are interested in this type of work, call our office for a free consultation, and we will be happy to discuss your case with you in detail, and show you pictures of our work. Thank you for reading and Best Wishes for this new year. A Smile Makeover ---- What is it?